It’s a lonely rainy Saturday and the power is out. Everyone is bored because there’s no TV and no going outside. What time is it? Time to break out Monopoly as a last resort… At least, this is how the majority of people in this country learned the greatest of all games. Growing up my family actually loved playing board games and Monopoly was one of the first games I ever learned. Today it’s still a family favorite (that is, when it doesn’t end in a huge explosion 🙂 ) and it represents one of the things I loved most about my childhood. As I got older I began to realize that this game had a lot more to offer than ruining friendships. Mr. Monopoly actually has a lot of great personal finance wisdom, if we would only listen. Two nuggets of wisdom that this game teaches are to invest early and invest often. One of the essential strategies of Monopoly is to buy houses and hotels to place on your rental property. If you want to win, you need to buy houses as soon as you possibly can. Many people lose at Monopoly because they wait too long after they get a full color set to start buying houses. The earlier you buy the houses, the earlier people will land on them and have to pay you more money. The first person who has houses gains a huge advantage over the other players, and often times they win the game. In real life, this lesson applies to investing. Although you may not be investing in houses and hotels, the earlier you start investing your money the more you will end up with. Now I know you’re thinking “of course the earlier you invest the more you’ll have, it doesn’t take a rocket scientist to come up with that.” Whoah now, I know that it seems like common sense, but most people don’t know just how much those early years help. But seriously, as an example let’s look at two people who took two different paths and see what happens. Jill learned early on (probably from playing Monopoly) that the sooner you start investing, the better off you will be. So when she graduated college at 22 years old she began investing as much as she could at $250 per month. She did this for 15 years and with a modest 7% compound annual growth rate, at the end of 15 years her account was worth $79,000. Jill, now age 37, decided she isn’t going to invest any more money and she will let her money grow from there. Continuing at 7% until Jill is 75 years old (38 years later) the account will then be worth $1,036,000!! And she never invested a dime after age 37! Now let’s look at Jack. It took Jack some time to understand that he needed to invest. He always thought that retirement was far far away and he had plenty of time. Besides, he enjoyed spending his new salary after he got out of college. And anyways, he deserved it for working so hard to make it through school. Although Jill tried to talk some sense into him, Jack didn’t start to invest until he was 30 (8 years after Jill). Like Jill, he invested $250 a month and got a 7% annual return. However, here’s the difference. Jack didn’t stop investing like Jill did, instead he continued investing all the way until he was 75 years old. You would think that obviously Jack would have a lot more than Jill since he kept adding to it for 45 years. But check this out. Jack’s account is actually only worth $948,000. That means Jill invested for 15 years and then stopped while Jack invested for 45 years and yet Jill had $88,000 more than Jack at 75 years old! And all because she started 8 years before her brother. As you can see, starting early makes a huge difference. And just think if Jill had kept investing that $250 every month; if she had, her account would be worth $1,689,000 leaving Jack in the dust. 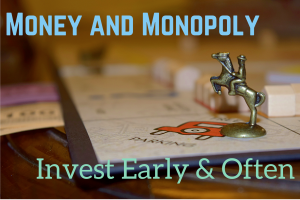 Not only is it important to buy houses as early as you can in Monopoly, it’s equally as important to keep buying more houses as you get the money. If you want to win Monopoly you have to reinvest the money you make from the houses, to buy more houses. If you pass go and collect $200, buy more houses. If you win second place in a beauty contest, buy more houses. If you take a ride on the reading railroad, buy more houses. If you land on free parking, buy more houses. Bottom Line: when you get money, buy houses. Period. In real life we can’t dump every dime we make into our investment account, but the more often we can invest the better off we will be. Take for example someone who invests $3,600 a year. If they invested $3,600 once a year on January 1st for 50 years at 7% they would have $1,463,000. Sure, that’s a bunch of money, but if they invested that $3,600 on a monthly basis at $300 per month for the same 50 years they would have $1,634,000! They end up with $170,000 more just because they invested monthly instead of yearly! This happens because of compound interest. Compound interest helps to grow your money rapidly and the more often you can feed it, they more effective it becomes. For those of you that don’t know what compound interest is (and don’t feel bad, I didn’t for a long time) let me explain. Compound interest is a fancy term that is used to describe how interest is calculated. Then the third month you would get %1 on $100, $1, and $1.10. Do you see how quickly this starts to build on itself? Hence, it compounds. Once the numbers get bigger, compound interest really starts to shine. For example, if instead of starting with $100 we started with $100,000, at the end of the first month the amount is worth $101,000. Then at the end of the second month it’s $102,010. And at the end of the third month it’s $103,030. It’s gaining over $1,000 each month and continues to grow. Compound interest grows your money more rapidly the more often you invest. This is why it’s important to create a habit of investing regularly; like every month. Invest early and often. If you do that you can maximize the amount of money you will have later in life. There are only a handful of situations where it doesn’t make sense to start investing right now, even if it’s a small amount. It is absolutely extremely important for you to start today. Not only will it set you up for success years from now, it also changes your mindset about money and helps you become a long-term thinker. By starting to set aside money every month for investing you are creating habits and developing a mindset that will help you for the rest of your life. If you’re wondering how to invest or what to invest in, be sure to sign up for my email newsletter below. I’ve already got some posts planned that will outline exactly how you can start investing. Sign up to get the latest posts plus extra tips that are only available to subscribers! As always, if you have any questions at all please email me. If you are convinced that you need to get started investing and just don’t know where to begin please shoot me email or leave a comment below!